Captain Britain and The Knights of Pendragon in ” Taxi for Commander Thomas.” | The Captain Britain fans' page and blog. One great comic that used this tactic well was The Knights of Pendragon issue 1 from Marvel UK whose cover and first page hooks the reader, making them not just eager to buy the issue but also keen to add it to their pull lists, or at least it did for me. But who were The Knights of Pendragon, how does Captain Britain fit in and why were they one of Marvel UK’ s best comics and one of the few to make the transition to a second series ? Read on and all will be explained. 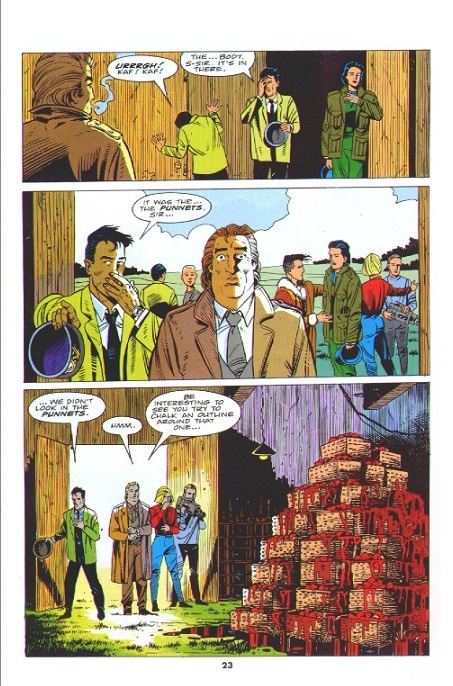 The Knights were launched in 1990 and their first series ran for 16 issues and their second ran for 15 issues, they were created by Dan Abnett and John Tomlinson , while Gary Erskine handled the early art and Andy Lanning the inks. The Knights are bought together to be the earthly representation of the Green Knight and help him in his battle against The Bane who is a destructive force of nature.The Captain Britain connections begin early as the first Knight selected is Dai Thomas one of Cap’s supporting characters, but I’m getting ahead of myself here lets look at issue 1 and what made it leap from the shelf into my heart. First off an Alan Davis cover always works for me and check the price of 95p what a bargain! However despite the almost supernatural look to this cover nothing prepares the reader for this great first page. 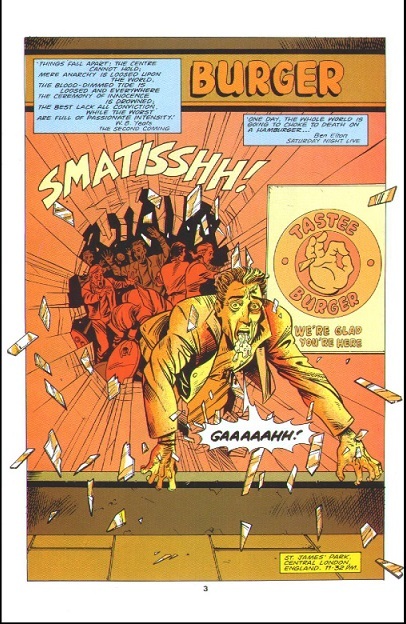 Yes that’s a riot in a burger bar as the customers choke to death, note how the use of quotes and graphic imagery predate a similar look in the mature comics range Vertigo by three years. Also I wonder if this image caused any complaints, as this violent illustration is certainly not what any reader would expect to find in what they might have mistaken for an all ages superhero comic with Captain Britain on the cover. 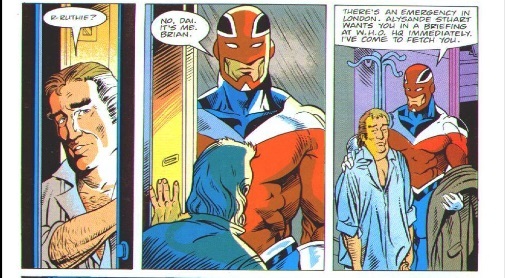 Anyway on with the story where Commander Thomas is summoned to London to oversea the burger bar investigation and here in a blink and you’ll miss it appearance is where Captain Britain turns up as an unofficial taxi service. Now normally I might moan here but Cap comes back in future Knights issues and has a good showing so I’m willing to overlook this mistreatment of him, plus Erskine draws him superbly looking so pissed off at the whole taxi idea. If you think after people choking to death on fast food this comic can’t get any more graphic then you like Commander Thomas will be taken by surprise by the last page reveal. The set up is Thomas has traced a lead from the burger incident back to a farm where the owner is using illegal chemicals and pesticides to boost his crop yield. However when Thomas turns up the farmer is suspiciously absent, that is until someone looks in the fruit punnets. Now remember this is an all ages comic and Erskine with his great art leaves very little to the imagination in this grisly scene, it’s also this page that made me realise I was reading something great and made me impatient to see what was going to happen in issue 2. As I said earlier the Knights had two series of comics and I would recommend any fan of good reading get series one but not series 2. Why ignore the second series, well in my opinion it took everything that was great with the first and ignored them to turn the team into just a normal bunch of super heroes so the magic of the first series was never recaptured. However Andy Lanning has promised we will see the Knights in his Marvel UK revival , whether they will be the cool first series Knights or the sub par super hero team from the second series remains to be seen, I know which ones I want. This entry was posted in Marvel UK and tagged Andy Lanning, Dan Abnett, John Tomlinson, Knights of Pendragon, Marvel UK by Richard. Bookmark the permalink. 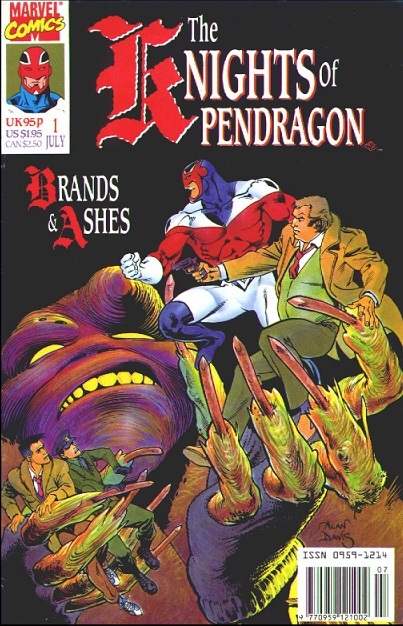 Knights of Pendragon was possibly Marvel UK’s crowning achievement for me after the Moore/Delano/Davis era of Captain Britain. The strawberries inccident still makes me gag to think of it to this day. Superb. So true , bit apprehensive about the Knights return but we shall see.